A quick email this month to let you know that Glue is to descend upon The Cornershop in Shoreditch this Saturday. Entry is recession-bustingly FREE all night, so there’s no excuse for not attending! 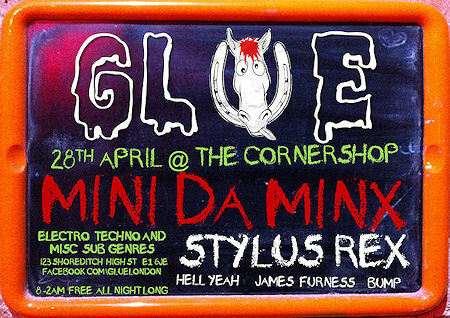 Headlining is Mini Da Minx, supported by Stylus Rex, Hell Yeah, bump and myself. You can catch me playing the closing set of the night, from 1am-2am. No-holds-barred dancefloor destruction guaranteed or double your entry fee back! Finally, don’t forget to check out my promo mix for last month’s glue if you haven’t already. After last month’s stellar comeback Glue is once again part of your life. However we are now no longer tied to one venue and like medieval minstrels we will spread our tunes of joy far and wide! For April you will find us in Shoreditch’s Cornershop – a lovely little venue that also has the advantage of being FREE all night so you don’t even have to pay to get your next dose of Glue. Headlining are Stylus Rex and Mini da Minx. The former has recently launched an album to great acclaim with positive write ups in the specialist press and broadsheets alike. Mini da Minx has been a big part of the London scene for a last few years – both as a promoter and a DJ. 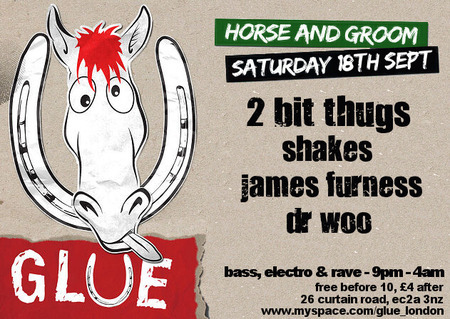 Expect both our guests to play Glue’s trademark mix of breaks, electro, house & techno. Supporting our guests will be our usual trio of home cooked heroes – James Furness, Hell Yeah & bump. Hell Yeah will kick the night off with some funkier party beats before bump takes us on one of his patented techno journeys. James Furness will then finish the night off in his normal classy style with some proggier sounds. Welcome back to the podcast, sorry it’s been a little while since the last one! This month’s podcast is to promote Glue, coming up this Friday at the Star of Kings in Kings Cross. Headlining is Pete Jordan from Spectrum, and in addition to him we have the usual trio of Hell Yeah, Bump and of course myself. A very quick email to let you all know I will be taking a brief respite from my all-consuming day job to play some tunes tonight at Frank’s Night Off. Only a brief respite though, as I will be kicking off the festivities with some chilled out minimal techno and house from 10pm-11pm so that I can get home before turning into a pumpkin. So get down early to avoid disapointment and enjoy a night of the very finest techno and house! We’ve booked the basement of the Russian Bar. It’s small, sweaty and great fun. So, the weekend has landed (well, almost!) 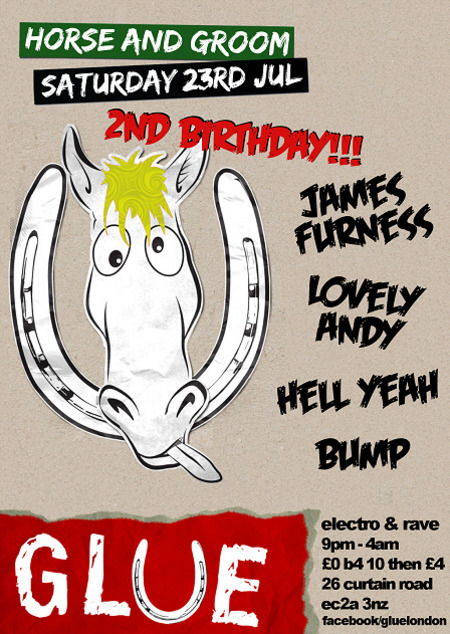 and it looks set to be a scorcher… Probably not on the weather front, knowing the good old British summer, but because it is Glue’s 2nd birthday this Saturday! …well ok perhaps one Prima Donna as the lovely people at Glue have given me the honour of headlining their wonderful evening. And to celebrate this special occasion I have been digging in some unusual crates to find something really… quite different… for your listening pleasure tomorrow night. And that’s all I can say on the matter. Catch me 12.30-2.15am tomorrow night at the Horse & Groom to find out more! As usual entry is free before 10pm, or a mere £4 after 10pm. Incredibly Glue is two years old! Seems like only yesterday we were pacing around the delivery room, anxiously awaiting of the arrival of London’s brightest new club night. Yet here we are, entering the terrible twos and as always ready for some serious partying! To mark this very special occasion we’ll be putting on a very special night with four of our very favourite DJs, not to mention a few birthday surprises thrown into the mix too. Playing the peak time slot is regular guest and all round DJ hero, James Furness. He first played for us at our very first We Have Fun way back in 2008 and has been back many times, including several iconic sets at Glue. Expect some real treats for the big birthday party with his set taking in house, electro, breaks and a lot beside. Kicking the celebrations off is a man that is no stranger to Glue – back from his baby enforced hiatus is Hell Yeah! The former resident and co-creator will be once again be gracing the decks at Glue, playing some funkier tunes at the start of the night and no doubt setting the party up perfectly for the chaos that will follow! Finally, we have our loyal and most trusted resident, bump. He’s played more Glues than anyone and set the musical tone perfectly each time. So once again he’ll be doing his techno thing and taking the Horse & Groom from a nice little pub to mental party zone in 105 minutes! So don’t miss out on the best birthday party ever!!! This month’s podcast is based around some of the seriously chunky Techno I’ve collected over the last few months since my return, and is very much all about the bass so make sure you have your subwoofer cranked right round to 11! Let me know what you think of the mix! Leave your comments using the form below, or on my Facebook page.